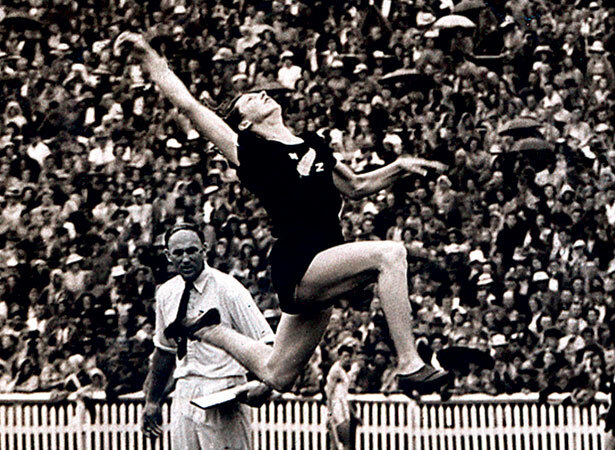 Yvette Williams (later Corlett) won the long jump to become New Zealand’s first female Olympic medallist. Thanks to amateur radio operators who were monitoring shortwave broadcasts, New Zealanders who stayed up through the night were able to follow her progress. After leading the qualifying round with a jump of 6.16 m, Williams began the final round with two no-jumps. Facing elimination, she leaped 5.9 m to make the top six and earn three more jumps. Her fourth jump was outstanding. At 6.24 m (20 feet 5¾ inches), it was just 1 cm short of the world record. Williams had set a new Olympic record and won gold for New Zealand. International Olympic Committee member Sir Arthur Porritt presented Williams with her gold medal. The New Zealand flag was raised and the Finnish military band played both ‘God Save the Queen’ and ‘God Defend New Zealand’. It was to be 40 years before New Zealand celebrated another female Olympic gold medallist – windsurfer Barbara Kendall at Barcelona (see 2 August). We have 8 biographies, 7 articles, related to Yvette Williams leaps for gold at Helsinki.